This article is about the Roman statesman who reorganized the army, and was seven times Consul. For his son, see Gaius Marius the Younger. For other people with the name Marius, see Maria (gens). Gaius Marius[nb 1] (/ˈɡeɪəs ˈmɛəriəs, ˈmær-/; 157 BC – January 13, 86 BC) was a Roman general and statesman. He held the office of consul an unprecedented seven times during his career. He was also noted for his important reforms of Roman armies, authorizing recruitment of landless citizens, eliminating the manipular military formations, and reorganizing the structure of the legions into separate cohorts. Marius defeated the invading Germanic tribes (the Teutones, Ambrones, and the Cimbri), for which he was called "the third founder of Rome." His life and career were significant in Rome's transformation from Republic to Empire. Marius was born in 157 BC in the town of Arpinum in southern Latium. The town had been conquered by the Romans in the late 4th century BC and was given Roman citizenship without voting rights. Only in 188 BC did the town receive full citizenship. Although Plutarch claims that Marius' father was a labourer, this is almost certainly false since Marius had connections with the nobility in Rome, he ran for local office in Arpinum, and he had marriage relations with the local nobility in Arpinum, which all combine to indicate that he was born into a locally important family of equestrian status. The problems he faced in his early career in Rome show the difficulties that faced a "new man" (novus homo). There is a legend that Marius, as a teenager, found an eagle's nest with seven chicks in it – eagle clutches hardly ever have more than 3 eggs; even if two females used the same nest, finding 7 offspring in a single nest would be exceptionally rare. Since eagles were considered sacred animals of Jupiter, the supreme god of the Romans, it was later seen as an omen predicting his election to the consulship seven times. Later, as consul, he decreed that the eagle would be the symbol of the Senate and People of Rome. In 134 BC, he was serving with the army at Numantia and his good services brought him to the attention of Scipio Aemilianus. Whether he arrived with Scipio Aemilianus or was already serving in the demoralized army that Scipio Aemilianus took over at Numantia is not clear. 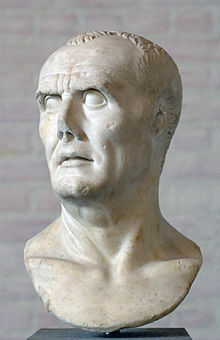 According to Plutarch, during a conversation after dinner, when the conversation turned to generals, someone asked Scipio Aemilianus where the Roman people would find a worthy successor to him. Aemilianus then gently tapped on Marius' shoulder, saying: "Perhaps this is the man." It would seem that even at this early stage in his army career, Marius had ambitions for a political career in Rome. He ran for election as one of the twenty-four special military tribunes of the first four legions who were elected (the rest were appointed by the magistrate who raised the legion). Sallust tells us that he was unknown by sight to the electors but was returned by all the tribes on the basis of his accomplishments. Next, he ran for the quaestorship after losing an election for local office in Arpinum. The military tribunate shows that he was already interested in Roman politics before the quaestorship. Perhaps he simply ran for local office as a means of gaining support back home, and lost to some other local worthy. Nothing is known of his actions while quaestor. In 120 BC, Marius was returned as plebeian tribune for the following year. He won with the support of Quintus Caecilius Metellus (later known as Metellus Numidicus), who was an inherited patronus. The Metelli, though neither ancient nor patrician, were one of the most powerful families in Rome at this time. During his tribunate, Marius pursued a populares line. He passed a law that restricted the interference of the wealthy in elections. In the 130s voting by ballot had been introduced in elections for choosing magistrates, passing laws and deciding legal cases, replacing the earlier system of oral voting. The wealthy continued to try to influence the voting by inspecting ballots and Marius passed a law narrowing the passages down which voters passed to cast their votes in order to prevent outsiders from harassing the electors. In the passage of this law, Marius alienated the Metelli, who opposed it. Soon thereafter, Marius ran for the aedileship and lost. This loss was at least in part due to the enmity of the Metelli. In 116 BC he barely won election as praetor for the following year (presumably coming in sixth) and was promptly accused of ambitus (electoral corruption). He barely won acquittal on this charge, and spent an uneventful year as praetor in Rome (as Urban Praetor, Peregrine Praetor or President of the extortion court). In 114 BC, Marius' imperium was prorogued and he was sent to govern Hispania Ulterior (Further Spain), where he engaged in some sort of minor military operation: according to Plutarch, he cleared away the robbers whilst robbery was still considered a noble occupation by the local people. During this period in Roman history governors seem regularly to have served two years in Hispania, so he was probably replaced in 113 BC. He received no triumph on his return and did not apparently run for the consulship, but he did marry Julia, the aunt of Julius Caesar. The Julii Caesares were a patrician family, but at this period seem to have found it hard to advance above the praetorship (only once in the 2nd century – in 157 BC – did a member of the family become consul). To judge by this marriage, Marius had apparently achieved some substantial political or financial influence by this point (possibly from his governship in Hispania). The Marii were the inherited clients of the Caecilii Metelli and a Caecilius Metellus had aided Marius' campaign for the tribunate. Although he seems to have had a break with the Metelli as a result of the laws he passed while tribune, the rupture was not permanent, since in 109 BC Quintus Caecilius Metellus took Marius with him as his legate on his campaign against Jugurtha. Legates (legati) were originally simply envoys sent by the Senate, but men appointed as legates by the Senate were used by generals as subordinate commanders, usually becoming the general's most trusted lieutenant. Hence, Metellus had to have asked the Senate to appoint Marius as legate to allow him to serve as Metellus' subordinate. In Sallust's long account of Metellus' campaign no other legates are mentioned, so it is assumed that Marius was Metellus's senior subordinate and right-hand man. Thus Metellus was using Marius' military experience, while Marius was strengthening his position to run for the consulship. The rupture in 119 BC may have been exaggerated after the fact in light of his later and much more serious disagreement with Metellus about Numidia. By 108 BC, Marius conceived the desire to run for the consulship. Despite lack of approval from Metellus (brought on by Marius' status as a novus homo) who instead advised Marius to wait and run with Metellus' son (who was only twenty, which would signify a campaign 20 years in the future) Marius began to campaign for the consulship. Sallust claims that this was catalyzed, in part, by a fortune-teller who "told him that great and wonderful things were presaged to him that he might therefore pursue whatever designs he had formed trusting to the gods for success, and that he might try fortune as often as he pleased for that all his undertakings would prosper." Marius soon earned the respect of the troops by his conduct towards them, eating his meals with them and proving he was not afraid to share in any of their labours. He also won over the Italian traders by claiming that he could capture Jugurtha in a few days with half Metellus' troops. Both groups wrote home in praise of him, suggesting that he could end the war quickly unlike Metellus, who was pursuing a policy of methodically subduing the countryside. Eventually Metellus gave in, realizing that it was counterproductive to have a resentful subordinate. Under these circumstances, later that year, Marius was triumphantly elected consul for 107 BC. He was campaigning against Metellus's apparent lack of swift action against Jugurtha. Because of the repeated military debacles from 113 BC to 109 BC and the accusations that the oligarchy was open to flagrant bribery, it became easier for the virtuous new man who had worked with difficulty up the ladder of offices to be elected as an alternative to the inept or corrupt nobility. The Senate had a trick up its sleeve, however. In accordance with the provisions of the Lex Sempronia on Consular provinces, which dictated that the Senate in a given year was to determine the Consular provinces for the next year at the end of year before the elections, the Senate decided not to make the war against Jugurtha one of the provinces and to prorogue Metellus in Numidia. Marius got around this through a ploy that had been used in 131 BC. In that year there was a dispute as to who should command the war against Aristonicus in Asia, and a tribune had passed a law authorizing an election to select the commander (there was precedent for this procedure from the Second Punic War). A similar law was passed in 108 BC and Marius was voted the command by the People in this special election. Metellus shed bitter tears when he learned of the decision. Upon returning home, he avoided meeting Marius, and was granted a Triumph and the agnomen Numidicus (conqueror of Numidia). The most dramatic and influential changes Marius made to the Roman army were named the Marian Reforms. In 107 BC, shortly after being elected as Consul, Marius, fearing barbarian invasion, saw the dire need for an increase in troop numbers. Until this time, the standard requirements to become a Roman soldier were very strict. To be considered a soldier in the service of the republic, an individual was required to provide his own arms and uniform for combat. Marius relaxed the recruitment policies by removing the necessity to own land, and allowed all Roman citizens entry, regardless of social class. The benefits to the army were numerous, with the unemployed masses enlisting for military service alongside the more fortunate citizens. Poorer citizens were drawn to lifelong service, as they were rewarded with the prospect of settlement in conquered land. This also 'Romanized' the population in newly subjugated provinces, thus reducing unrest and lowering the chance of revolt against the Roman Republic. The new Roman army, its numbers vastly bolstered by lower class citizens whose future was tied to their permanent career, was always able to provide reserves in times of disaster. In addition, the growth of the army ensured continued military success due to the high number of recruits available for each campaign. Even though the army increased in size considerably, Marius also sought to improve organization among his troops. Marius needed more troops, and to this effect he made a change in procedure used for recruiting troops, probably unaware of the momentous implications of this change. All of the Gracchian agrarian reforms had been premised on the traditional Roman levy, which excluded from service those whose property qualification fell below the minimum property qualification for the fifth census class. The Gracchi had tried to restore the smallholders who would constitute the majority of those qualified to serve. The end of the Gracchian land legislation did nothing to change the military crisis that gave rise to that legislation. It seems that the minimum qualification for the fifth census class (the lowest one eligible for military service) was lowered from 11,000 to 3000 sesterces of property, and already in 109 BC the consuls had had to seek suspension of Gaius Gracchus' restrictions on the levy. In 107 BC Marius decided to ignore the census qualification altogether and recruited with no inquiry into the property of the potential soldier. From now on Rome's legions would largely consist of poor citizens (the "capite censi" or "head count") whose future after service could only be assured if their general could somehow bring about a land distribution on their behalf. Thus the soldiers had a very strong personal interest in supporting their general against the Senate (i.e., the oligarchy) and the "public interest" that was often equated with the Senate. Marius did not avail himself of this potential source of support, but in less than two decades Marius' ex-quaestor Sulla would use it against the Senate and Marius. Marius found that ending the war was more difficult than he had claimed. He arrived comparatively late in 107 BC and in that year and the next he forced Jugurtha to the south and west toward Mauretania. Marius' quaestor in 107 BC had been Lucius Cornelius Sulla Felix, the son of a patrician family that had fallen on hard times. Marius was supposedly unhappy at receiving the dissolute youth as his subordinate, but Sulla proved a competent military leader. By 105 the king of Mauretania, Bocchus I, who was also Jugurtha's father-in-law and reluctant ally, was worried about the approaching Romans. After receiving word that an accommodation with them was possible, Bocchus insisted that Sulla make the hazardous journey to his capital, where Sulla induced Bocchus to betray Jugurtha, who was duly handed over to Sulla, thus ending the war. Since Marius held the imperium and Sulla was acting as his subordinate, the honor of capturing Jugurtha belonged strictly to Marius, but Sulla had clearly been immediately responsible and had a signet ring made for himself commemorating the event. Sulla would later claim that the credit for ending the war was his. Meanwhile, Marius was the hero of the hour, and his services would be needed in another emergency. The arrival of the Cimbri in Gaul in 109 BC and their complete defeat of Marcus Junius Silanus had resulted in unrest among the Celtic tribes recently conquered by the Romans in southern Gaul. In 107 the consul Lucius Cassius Longinus was completely defeated by the Tigurini clan, and the senior surviving officer (Gaius Popillius Laenas, son of the consul of 132) had saved what was left only by surrendering half the baggage and suffering the humiliation of having his army "march under the yoke." The next year (106 BC) another consul, Quintus Servilius Caepio, marched to Gaul and captured the disloyal community of Tolosa (Toulouse), where a huge sum of money (the Gold of Tolosa), was taken from shrines. The larger part of it mysteriously vanished when being transported to Massilia (Marseille). Caepio was prorogued into the next year, when one of the new consuls, Gnaeus Mallius Maximus, also operated in southern Gaul. Mallius was a new man like Marius, and he and the noble Caepio found it impossible to co-operate. The Cimbri and the Teutones (both migrating Germanic tribes) appeared on the Rhône, and while Caepio was on the west bank he refused to come to the aid of Mallius on the left. Eventually the Senate got Caepio's reluctant agreement to co-operate, but even when he crossed the river to help the threatened Mallius, he refused to join forces and kept his own at a fair distance. First the Germans routed Caepio and then destroyed Mallius's army on October 6, 105 BC at Arausio (modern Orange). Since the Romans fought with the river at their back, retreat was not possible and reportedly 80,000 were killed. The losses in the preceding decade had been bad enough, but this defeat, apparently caused by the arrogance of the nobility and its refusal to co-operate with talented non-nobles, was the last straw. Not only had huge numbers of Romans lost their lives but Italy itself was now exposed to invasion from barbarian hordes. The failure to deal with this threat marked the start of a period when dissatisfaction with the oligarchy (and thus, conflict between the optimates and the populares) was becoming increasingly, and dangerously, bitter. Sometime during this war Marius participated in the Trial of Trebonius. In late 105 BC Marius was elected consul again while still in Africa. Election in absentia was unusual enough, but at some time after 152 BC a law had been passed dictating a ten-year interval between consulships, and there is even some evidence to indicate that by 135 BC a law had been passed that prohibited second consulships altogether. Nonetheless by this time news of a new advancing tribe known as the Cimbri had reached Rome and in the emergency Marius was again chosen consul. The law was either repealed or set aside under the circumstances of emergency, as Marius was then elected to an unprecedented five successive consulships (104 BC–100 BC). He returned to Rome by January 1, 104 BC, when he celebrated his triumph over Jugurtha, who was first led in the procession, then killed in the public prison. The Cimbri conveniently marched into Hispania and the Teutoni milled around in northern Gaul, leaving Marius to prepare his army. One of his legates was his old quaestor, Sulla, which shows that at this time there was no ill-will between them. In 104 BC, Marius was returned as consul again for 103 BC. Though he could have continued to operate as proconsul, it seems that the position as consul would make his position as commander unassailable and avoid any problems with the consuls if he was only a proconsul. Marius seems to have been able to get exactly what he wanted, and it even seems that his support determined whom the people would elect as his colleagues (his choice was apparently determined, on several occasions, on the basis of their malleability: only Catulus in 102 BC, and Flaccus in 100 BC, would have been serious candidates in their own right without his support, and even Flaccus was described as more servant than partner in the office). In 103 BC, the Germans still did not emerge from Hispania, and conveniently Marius's colleague (L. Aurelius Orestes, son of C. Gracchus's commander in Sardinia in 126 BC–124 BC) died, so Marius had to return to Rome to oversee the elections, being re-elected for 102 BC. In 102 BC the Cimbri returned from Hispania into Gaul and together with the Teutones decided to invade Italy. The Teutones were to head south and advance toward Italy along the Mediterranean coast; the Cimbri were to attempt to cross the Alps into Italy from the north by the Brenner Pass; and the Tigurini (the allied Celtic tribe who had defeated Longinus in 107) were to cross the Alps from the northeast. This decision proved fatally flawed. The Germanic soldiers divided their forces, making each contingent manageable, and the Romans could use their shorter lines of communication and supply to concentrate their forces at will. First, Marius had to deal with the Teutones, who were in the province of Narbonensis marching toward the Alps. He refused to give them a battle where they wanted, and withdrew to Aquae Sextiae (a settlement founded by Gaius Sextius Calvinus in 124 BC), which blocked their path. The leading contingent of the Germanic warriors, the Ambrones, attacked the Roman position without waiting for reinforcements and 30,000 were killed. Marius then hid 3,000 troops in ambush, so when the main Germanic contingent finally attacked, the hidden Roman troops could fall on them from behind. In the ensuing defeat, the Teutones were completely annihilated, to the number of something over 100,000. Marius' consular colleague in 102 BC, Quintus Lutatius Catulus, did not have as much luck. His forces were unable to hold the Brenner Pass, allowing the Cimbri to advance into northern Italy by late 102 BC. Marius was in Rome, and after being elected consul for 101 BC and deferring his Triumph over the Teutones, he marched north to join Catulus, whose command was prorogued into 101. Finally, in the summer of that year a battle was fought at Vercellae in Cisalpine Gaul. Once again, Roman discipline overcame a larger barbarian force. At least 65,000 were killed (perhaps as many as 100,000 again) and all the remainder enslaved. The Tigurini gave up their efforts to enter Italy from the northeast and went home. Catulus and Marius celebrated a joint Triumph, but in popular thinking all the credit went to Marius, who was praised as "the third founder of Rome." Catulus became alienated from Marius and would later become one of his chief opponents. As a sort of reward (the danger was now gone) Marius was returned as consul for 100 BC. This year would not go at all well for Marius. During the year of Marius' sixth consulship (100 BC), Lucius Appuleius Saturninus was tribune of the plebs for the second time (having apparently had Marius's support on both this occasion and the previous one), and advocated reforms like those earlier put forth by the Gracchi. Saturninus pushed for a bill that gave colonial lands to the veterans of Marius' recent war, and offered to lower the price of wheat distributed by the state. In scandalous circumstances, Saturninus and his ally Gaius Servilius Glaucia also achieved the exile of Marius' personal enemy, his former commanding officer Q. Metellus Numidicus, apparently with Marius' support. The Senate, however, increasingly opposed Saturninus' measures. Eventually, Saturninus and Glaucia had an opponent, C. Memmius, assassinated during the magisterial elections for 99 BC, prompting widespread violence. As a result, the Senate issued its 'final decree' (the Senatus consultum ultimum), and ordered Marius, as consul, to put down the revolt. Marius, although he was generally allied with the radicals, complied with the request and put down the revolt in the interest of public order. Marius attempted to keep Saturninus and his followers alive by locking them safely inside the Senate House, where they would await prosecution according to the law. However, an angry mob climbed the walls of the building and, by dislodging the roof tiles and throwing them at the prisoners below, lynched those inside. In complying with the Senate's wishes, Marius tried to show the senate, who had always been suspicious of his motives, that he was one of them instead of the outsider that Quintus Metellus said he was in 108 BC. Marius' overall concern, for his part, was always how to maintain the Senate's esteem: in the words of the scholar A.N. Sherwin-White, Marius 'wanted to end his days as vir censorius, like the other great worthies among the novi homines of the second century'. After the events of 100 BC, Marius at first tried to oppose the recall of his inimicus Metellus Numidicus, who had been exiled by Saturninus in 103. However, seeing that opposition was impossible, Marius decided to travel to the east in 98 BC, ostensibly to fulfil a vow he had made to the goddess Bona Dea. Marius' biographer, Plutarch, portrays this voluntary exile as a great humiliation for the six-time consul: 'considered obnoxious to the nobles and to the people alike', he was even forced to abandon his candidature for the censorship of 97. Plutarch also reports that while in the East, Marius attempted to goad Mithridates VI of Pontus into declaring war on Rome, so that the Roman people might be forced to rely on Marius' military leadership once more. However, scholars have pointed out that Marius' supposed 'humiliation' cannot have been too long-lasting. In c. 98-97 BC, he was given the unprecedented honour of being elected in absentia to the college of priestly augurs whilst away in Asia Minor. Furthermore, Marius' mere presence at the trial in c. 98 BC of M'. Aquillius, his friend and former colleague as consul in 101 BC, was enough to secure acquittal for the accused, even though he was apparently guilty. In c. 95 BC, Marius also successfully acted as sole defence for T. Matrinius, an Italian from Spoletium who had been granted Roman citizenship by Marius and who was now accused under the terms of the Lex Licinia Mucia. After the Social War, King Mithridates of Pontus began his bid to conquer Rome's eastern provinces and invaded Greece. In 88 BC, Lucius Cornelius Sulla was elected consul. The choice before the Senate was to put either Marius or Sulla in command of an army which would aid Rome's Greek allies and defeat Mithridates. The Senate chose Sulla, but Marius induced tribune Publius Sulpicius Rufus to call an assembly that subsequently appointed Marius (in this unsavory episode of politics, Marius had promised to erase the tribune's debts). Sulla refused to acknowledge the validity of the assembly's action. Sulla left Rome and travelled to the army waiting in Nola, the army that the Senate had asked him to lead against Mithridates. Sulla urged his legions to defy the assembly's orders and accept him as their rightful leader. Sulla was successful and the legions stoned the representatives from the assembly. Sulla then commanded six legions to march with him to Rome and institute a civil war. This was a momentous event, and was unforeseen by Marius, as no Roman army had ever marched upon Rome—it was forbidden by law and ancient tradition. Once it became obvious that Sulla was going to defy the law and seize Rome by force, Marius attempted to organize a defense of the city using gladiators. Unsurprisingly Marius' ad-hoc force was no match for Sulla's legions. Marius was defeated and fled Rome. Marius narrowly escaped capture and death on several occasions and eventually found safety in Africa. Sulla and his supporters in the Senate passed a death sentence on Marius, Sulpicius and a few other allies of Marius. A few men were executed but, according to Plutarch, many Romans disapproved of Sulla's actions; some who opposed Sulla were actually elected to office in 87 BC (Gnaeus Octavius, a supporter of Sulla, and Lucius Cornelius Cinna, a supporter of Marius, were elected consul). Regardless, Sulla was confirmed again as the commander of the campaign against Mithridates, so he took his legions out of Rome and marched east to the war. While Sulla was on campaign in Greece, fighting broke out between the conservative supporters of Sulla, led by Octavius, and the popular supporters of Cinna. Marius along with his son then returned from exile in Africa with an army he had raised there and combined with Cinna to oust Octavius. This time it was the army of Marius that entered Rome. Some of the soldiers went through Rome killing the leading supporters of Sulla, including Octavius. Their heads were exhibited in the Forum. All told some dozen Roman nobles had been murdered. The Senate passed a law exiling Sulla, and Marius was appointed the new commander in the eastern war. Cinna was chosen for his second consulship and Marius to his seventh consulship. After five days, Cinna and the populares general Quintus Sertorius ordered their more disciplined troops to kill the rampaging soldiers. In his Life of Marius, Plutarch writes that Marius's return to power was a particularly brutal and bloody one, saying that the consul's "anger increased day by day and thirsted for blood, kept on killing all whom he held in any suspicion whatsoever." Among these included former consul Q. Lutatius Catulus and the orator Marcus Antonius, grandfather of Mark Antony. Plutarch writes that "whenever anybody else greeted Marius and got no salutation or greeting in return, this of itself was a signal for the man's slaughter in the very street, so that even the friends of Marius, to a man, were full of anguish and horror whenever they drew near to greet him." Plutarch relates several opinions on the end of Marius: one, from Posidonius, holds that Marius contracted pleurisy; Gaius Piso has it that Marius walked with his friends and discussed all of his accomplishments with them, adding that no intelligent man ought leave himself to Fortune. Plutarch then anonymously relates that Marius, having gone into a fit of passion in which he announced in a delusionary manner that he was in command of the Mithridatic War, began to act as he would have on the field of battle; finally, ever an ambitious man, Marius lamented, on his death bed, that he had not achieved all of which he was capable, despite his having acquired great wealth and having been chosen consul more times than any man before him. Marius died on January 13, 86 BC, just seventeen days into his seventh consulship. just as Plato was wont to say often to Xenocrates the philosopher, who had the reputation of being rather morose in his disposition, "My good Xenocrates, sacrifice to the Graces," so if Marius could have been persuaded to sacrifice to the Greek Muses and Graces, he would not have put the ugliest possible crown upon a most illustrious career in field and forum, nor have been driven by the blasts of passion, ill-timed ambition, and insatiable greed upon the shore of a most cruel and savage old age. His improvements to the structure and organization of the Roman legion were profound and effective. However, he was, in part, responsible for the breakdown in relations with Sulla which led to the latter's march on Rome. He himself had broken with tradition on previous occasions and his effort to reverse the Senate's appointment of Sulla as commander of the Mithridatic War was highly questionable under Roman constitutional tradition. The five days of terror upon his return to Rome saw many hundreds slaughtered in his name. The Marian reforms to the legions, recruiting among un-propertied urban citizens, was a pivotal step leading in short order to the collapse of the Republic. Marius set the precedent of recruiting among the poor and then granting these veterans land upon the conclusion of the campaign. Thus the legions became more loyal to their generals than to the state. The loyalty of such legions is what allowed Marius himself, Sulla, and about 40 years later Marius' nephew Julius Caesar to march on Rome itself. The struggle between Marius and Sulla led to the deaths of numerous distinguished Roman senators, equestrians and unknown thousands of Roman soldiers and citizens. It set a precedent for the civil wars to come that led ultimately to the destruction of the Republican form of government and thus to the establishment of the principate system of the Empire. The historical novels The First Man in Rome and The Grass Crown, by Colleen McCullough, largely focus on the rise and fall of Gaius Marius and his lengthy career. The short story "Marius", by American science fiction author Poul Anderson, uses the historical Marius, and the destructive effects of his acts on the long-term viability of the Roman Republic, to illuminate the motivation of the protagonist in a conflict in post-World War III Europe. The poems Marius Amongst the Ruins of Carthage by Felicia Hemans (in The Edinburgh Magazine, 1821) and Marius at the Ruins of Carthage by Letitia Elizabeth Landon (in The Keepsake, 1833) both dwell on his state of exile there and his still rebellious spirit. ^ C·MARIVS·C·F·C·N is how Marius was termed in official state inscriptions in Latin: "Gaius Marius, son of Gaius, grandson of Gaius"
^ a b Plutarch. Life of Marius. p. 27.5. ^ Hildinger, Erik (2002). "Chapter 5: The Jugurthine War". Swords Against the Senate: The Rise of the Roman Army. Rome: Da Capo Press. p. 59. ISBN 0-306-81168-5. To gain political advantage with the common people he later claimed to have risen from poverty, but actually his father had been some sort of local knight or noble and he held the Roman citizenship – it had been granted to Arpinum in 188. Far from being a mere son of the soil, as he'd later have the ignorant believe, Marius was a knight, and though his fortune must originally have been modest by the standards of the Roman aristocracy, it would not have been entirely negligible. ^ Plutarch, (Lucius?) Mestrius. "Marius". The Parallel Lives. Loeb. p. 565. When, that is, he was quite young and living in the country, he had caught in his cloak a falling eagle's nest, which had seven young ones in it; at sight of this, his parents were amazed, and made enquiries of the seers, who told them that their son would be most illustrious of men, and was destined to receive the highest command and power seven times. ^ Conti, Flavio (2003). A profile of ancient Rome. Los Angeles: Getty Publ. p. 210. ISBN 0892366974. ^ "Plutarch, Life of Marius, 3". ^ Hazel, John (2002). Who's Who in the Roman World. Routledge. p. 187. ISBN 0-415-29162-3. [As tribune of the plebs] he threatened METELLUS Delmaticus for his opposition, thus earning the hostility of that family, which cost him the aedileship. ^ Plutarch. Life of Marius, 6. ^ Sallust. Sallust, Florus, and Velleus Paterculus. Translated by John Selby Watson. George Bell and Sons. Per idem tempus Uticae forte C.. Mario per hostias dis supplicanti magna atque mirabilia portendi haruspex dixerat: proinde quae animo agitabat, fretus dis ageret fortunam quam saepissiine experiretur, cuncta prospere eventura. At iilum iam antea consulatus ingens cu pido exagitabat, ad quern capiendum praeter vetustatem familiae alia omnia abunde erant industria probitas mili tiae magna scientia animus belli ingens domi modicus libidinis et divi tiarum victor tantum modo gloriae avidus. ^ Shuckburgh, Evelyn Shirley (1894). "Chapter XXXVII – The First Period of Civil Wars, 100-84". A History of Rome to the Battle of Actium. Macmillan and co. pp. 577–581. ^ Plutarch, Life of Marius, 43. ^ Plutarch, Life of Marius, 45. ^ Plutarch, Life of Marius, 45 & 46. ^ "Plutarch, Life of Marius". Carney, Thomas Francis. A Biography of C. Marius. Chicago: Argonaut, 1970 (ISBN 0-8244-0023-2). D'Arms, John H. "The Campanian Villas of C. Marius and the Sullan Confiscations", The Classical Quarterly, Vol. 18, No. 1. (1968), pp. 185–188. Evans, Richard J. Gaius Marius: A Political Biography. Pretoria: University of South Africa, 1994 (hardcover, ISBN 0-86981-850-3). Reviewed by John Carter in The Classical Review, Vol. 46, No. 2. (1996), pp. 313–315. Farrand, Michael J. The Man Who Saved History, narrative poem based on the life of Caius Marius found in Plutarch's Lives (originally Parallel Lives) by the Greek historian Plutarch. Frank, Elfrieda. "Marius and the Roman Nobility", The Classical Journal, Vol. 50, No. 4. (1955), pp. 149–152. Gilbert, C.D. "Marius and Fortuna", The Classical Quarterly, Vol. 23, No. 1. (1973), pp. 104–107. Hildinger, Erik, Swords Against the Senate: The Rise of the Roman Army and the Fall of the Republic, Da Capo Press, 2002 (softcover ISBN 978-0-306-81279-8). Kildahl, Phillip Andrew. Caius Marius. New York: Irvington Publishers, 1968 (hardcover, ISBN 0-8290-1756-9). Weinrib, Ernest Joseph. The Spaniards in Rome: From Marius to Domitian. London: Taylor & Francis Books, 1990 (hardcover, ISBN 0-8240-3308-6). Ancient Warfare magazine, Vol. V, Issue 1 (Feb/Mar, 2011), was devoted to "Gaius Marius: The 'new man' who saved Rome", with articles by Alberto Pérez, Michael J. Taylor, Christopher A. Matthew, Sean Hussmann, and Duncan B. Campbell. Wikimedia Commons has media related to Gaius Marius. Vancea, Oscar. The Military Reforms of Caius Marius, Clio History Journal, 2007. The Roman Army After Marius' Reforms—An introduction.